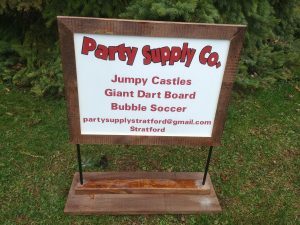 Jumpy Castles – Party Supply Co. There are 2 classifications for Jumpy Castle Rentals. Here are the differences. Public Events are those events where you do not know how many people will be attending and invitation to attend the event is open to the community. A private event is an event where you have specific group of people coming and it would be by written or verbal invitation only. Your circle of friends and family or employees with children etc. 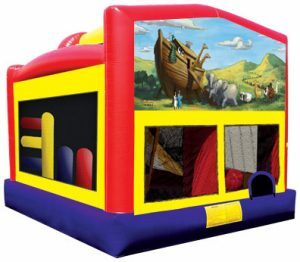 Jumpy Castles have become the name for a Jumper or Bounce House of any theme. There are 2 sets of prices as the T.S.S.A. 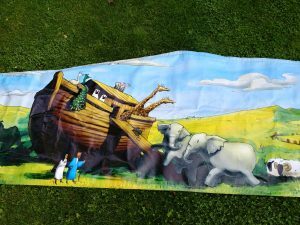 (the governing body) inspect all Jumpy Castles and after inspection we are required to license each item that is used at a Public Event therefore there is a separate price for these licensed items. This emblem shown below means the jumper is available for a public event. 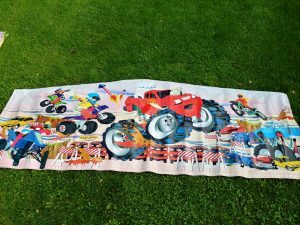 Below are the images of our items and along side each item there will be an indication of it’s designation as a licensed item for Public Event and/or Private Event and the rental rate. 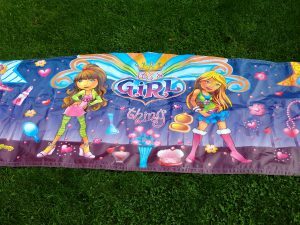 Theme Banners are available at no cost for the above 6 in 1 fun house interactive. 6 in 1 Fun House interactive. Licensed for public events by the T.S.S.A. $330. 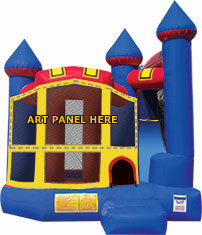 5 Hour Private Event 6 in 1 Fun House interactive Weekdays $275. Weekends and Holidays $299. 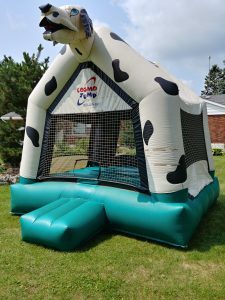 Includes delivery, set up, take down and take away in Stratford of this 385 lb attraction. 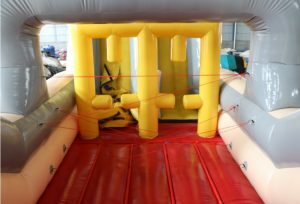 This item is fantastic for halls where you need a lower profile inflatable jumpy. 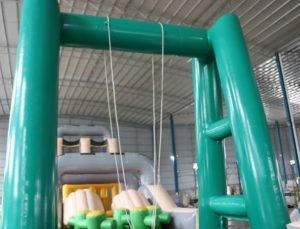 Includes 2 climbing areas, 2 sliding areas and 2 pop ups inside. Includes delivery, set up, take down and take away in Stratford of this 330 lb attraction. $300 5 hour Private Event. Includes delivery, set up, take down and take away in Stratford of this 430 lb attraction. Frozen Jumpy Licensed for public events by the T.S.S.A. starting at $225. $145. 5 hour Private Event . 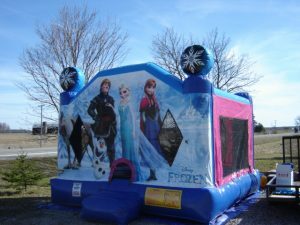 Includes delivery, set up, take down and take away in Stratford of this 200 lb attraction. 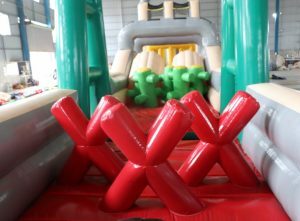 This custom built 2 lane obstacle for all ages will feature the following and is available in several configurations. 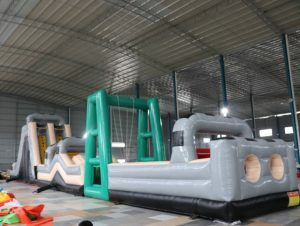 75 feet of sensational fun where you can race your friends or just play among the following. ……The following add on 40′ slip’n slide (not shown) is only available for private events. 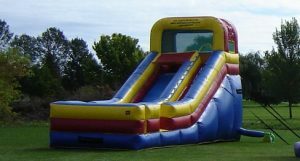 A Party Supply team member is supplied to keep the children safe and manage slider flow. 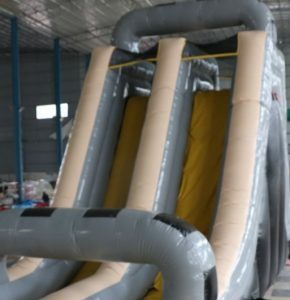 “added bonus 40′ slip and slide available at an extra cost”and finishing off the spectacular bottom of the Knight giant screamer water slide making this a whopping 100′ long attraction. Sensational!!!! Pricing yet to be established. 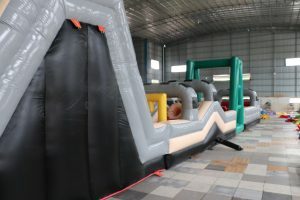 Private Event rental sections of the Knight Obstacle shown below. The above attraction will be available for private events in 2019. Licensing has not been confirmed yet. 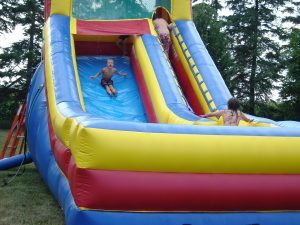 The water slide and slip’n slide will only be available for private events. This an adult and children friendly unit. 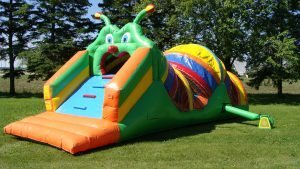 Private Event Children and Adult 3 piece complete with giant slide: $600. Private Children and Adult Rate complete with giant waterslide: extra $100. Private Children and Adult Rate complete with 17′ waterslide and 40′ slip and slide: extra $175. image to come showing this option with water slide and slip and slide option. Delivery out of town: To be determined dependent on location. Call for out of town delivery rates. Brand new and ready for private events like your backyard or rental hall, reunion or birthday. Available in early May and is not yet licensed. Includes a climbing area and a 10′ x 10′ jumping are leading to the exterior slide. Includes delivery, set up, take down and take away in Stratford of this 260 lb attraction. 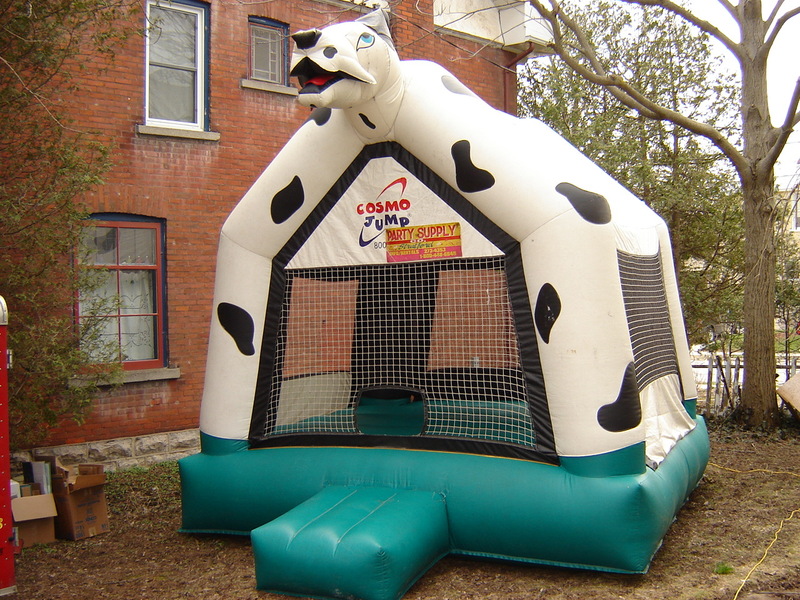 Dalmation Dog Bouncer perfect for Paw Patrol Party and only for Private Events. $115. Private Event 5 hour booking anytime week day or weekend. 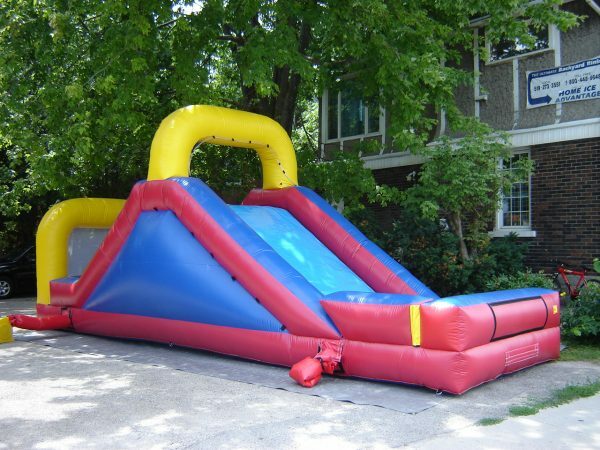 17′ Water Slide for Private Events only. 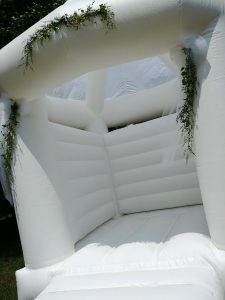 A Party Supply team member supplied to keep the children safe and manage slider flow. 5 Hour Private Event Weekday or Weekend Price $350. 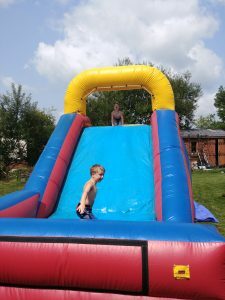 14′ Waterslide. A smaller version of the above. Private Event only. 5 Hour summer special Private Event only weekday or weekend $199. Includes delivery, set up, take down and take away in Stratford of this 230 lb attraction. 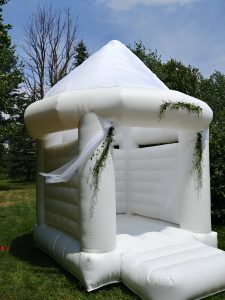 Highly sought after White Wedding Tent Bounce House for adults….and you could have the children try it too! Private Events only. Bachelorette parties and wedding receptions. Actual size is 10′ across including upright pillars by 12′ H x 12 L. Riders 4 – 6 depending on size. Last booking we pick up 30 minutes before dusk. Could you see yourself in there? Thought so!!! It’s a party…….Bachelorette? Reception? 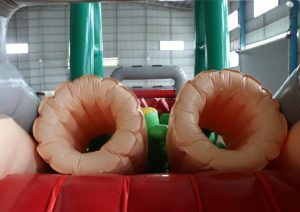 Adults and children are able to use this jumpy. 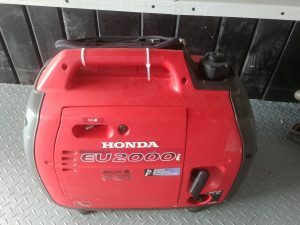 ………and we have generators too! Need your jumpy up in a remote location.We can do that!!!! $60. Includes a full tank of gas. Propane version as well! Proud to display our sign, at your event. The New PARTY SUPPLY Co.
© 2019 Party Supply Co.